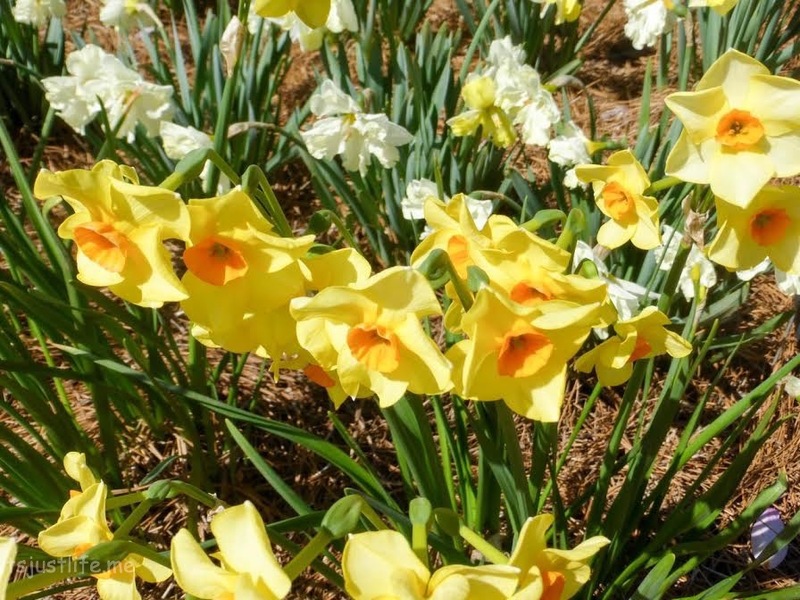 The birds are singing, the trees are budding (and pollinating unfortunately), the spring flowers are popping out and spring is in the air everywhere including at The Biltmore Estate in Asheville. 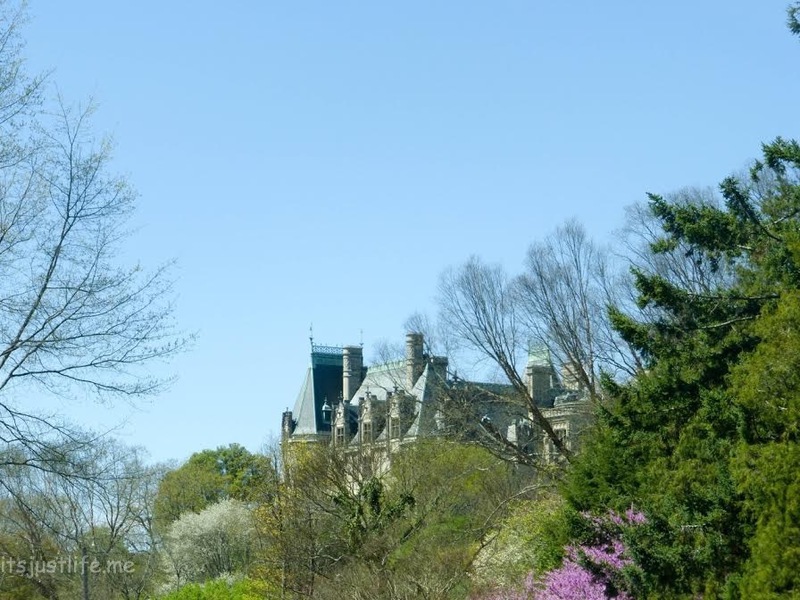 I have extolled my love of all things Biltmore here on the blog before and it is not a stretch to say that this is one of my happy spots right now. 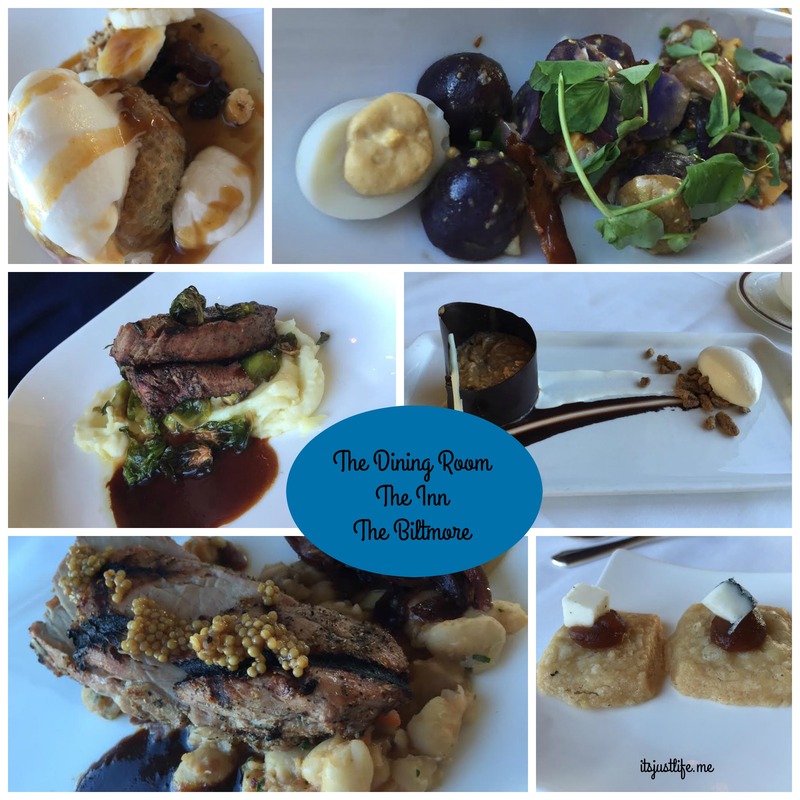 Chris and I headed over last Saturday for a bit of walking around and fine dining at The Dining Room at The Inn on the estate and we were thrilled to see how everything was blooming and beautifully showing all of the spring colors. 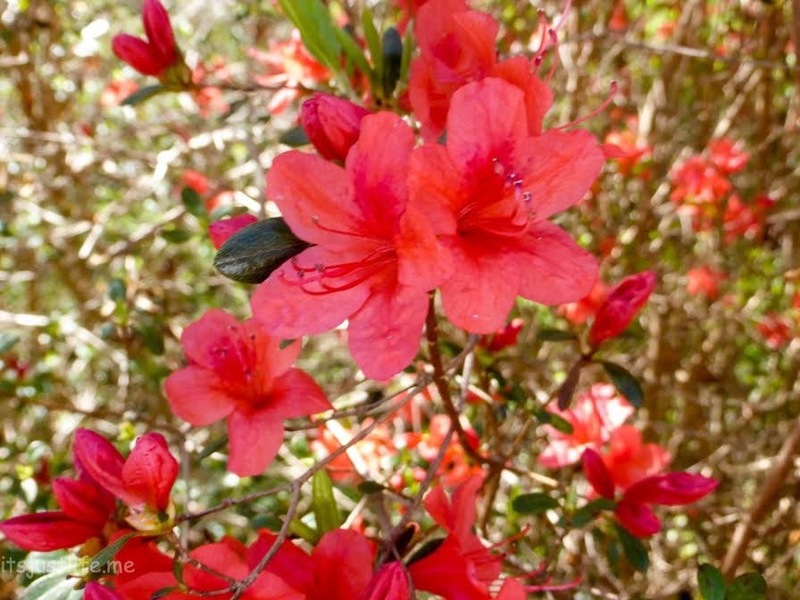 Why is it that the greens appear to be so vivid and the pinks and reds so eye catching in the spring? I don’t know the reason but perhaps it is because winter, although nothing like the Iowa winters, seems to drag on and we are just ready for the brightness of spring to make an entrance. It really doesn’t matter why–it just makes me so happy to see the colors and new life springing forth. There were a lot of people with the same idea on Saturday and the place was filled with people enjoying the wonderful sunshine and lovely weather. Chris managed to find a parking spot by the garden shop (he told me he would and he did –I should never doubt him) so we had an easy walk to the Walled Garden and the greenhouse which are my favorite stops when I visit. 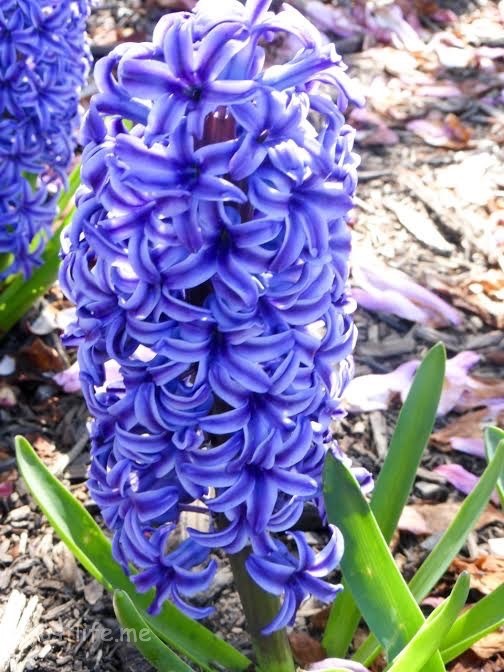 The tulips, daffodils and hyacinths are a welcome sight after the winter months, aren’t they? 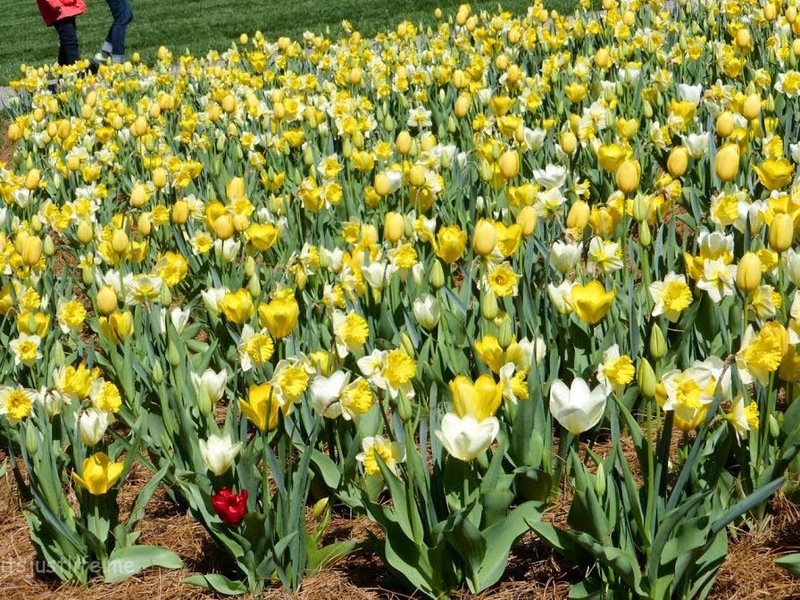 I particularly focused on one little area of one of the tulip beds. Can you guess why? 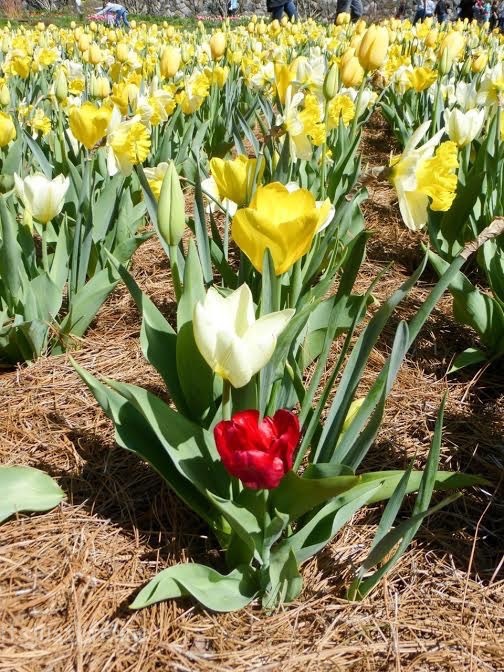 One lonely red tulip amongst the yellow and white backdrop. Was it planned? 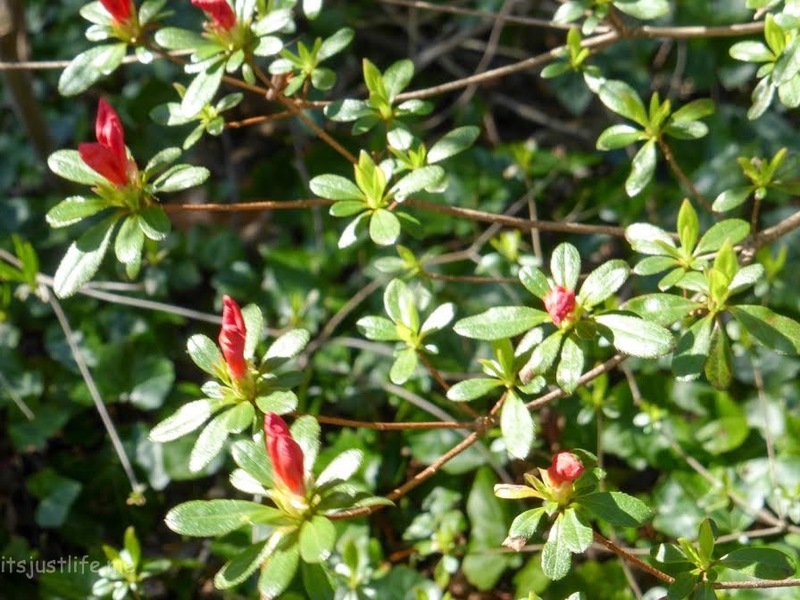 Another area that is just beginning to show signs of life is the Azalea garden. Chris and I had azaleas someplace we lived but heck if I can remember which house it was at. The reds are my favorite. Is that a surprise? 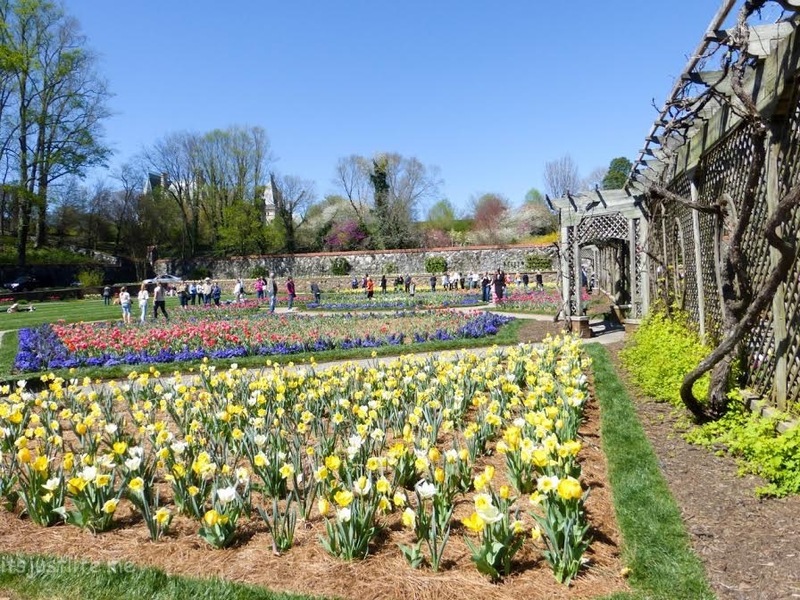 Biltmore has a social media campaign going on where they encourage visitors to take pictures and post on social media with #BiltmoreBlooms. They know a good marketing strategy when they see it. Who can resist “liking” pictures of beautiful flowers like these? 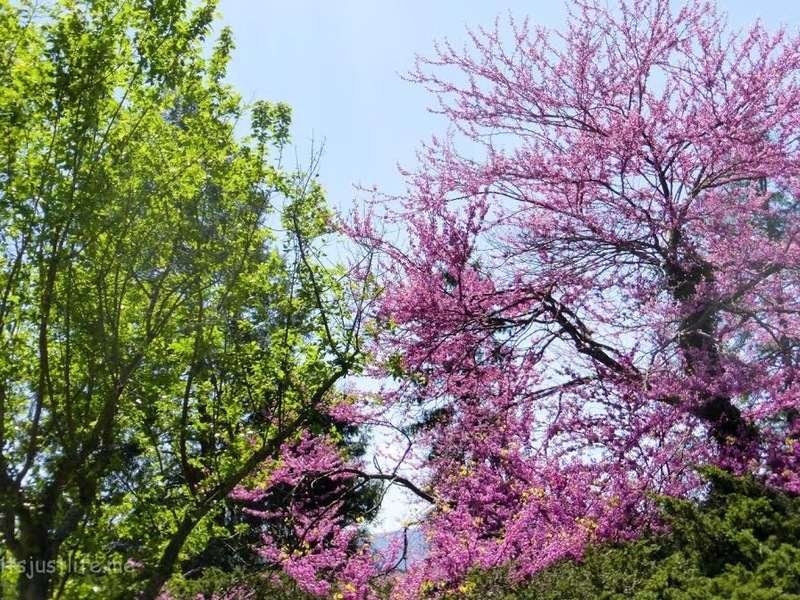 The redbud and other flowering trees are going full force right now and aren’t they just a sight for sore eyes? I especially loved this tree because it had ivy of some sort growing up the trunk right up to the top which provided a nice contrast to the airy pink flowers. 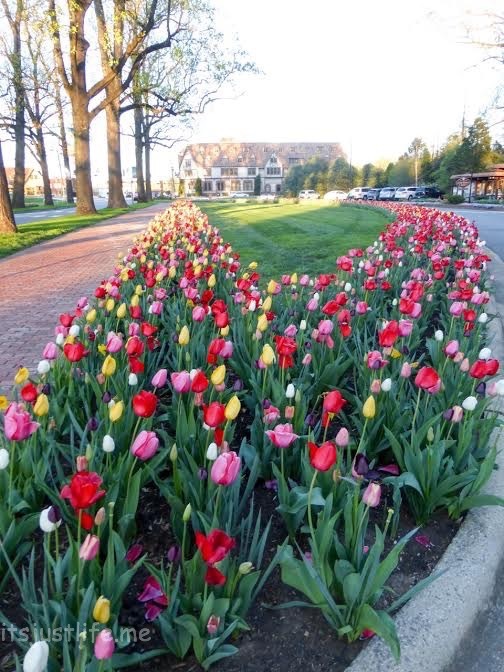 We stopped on the way out of the estate so I could capture a few of the stunning tulips that are planted at the entrance. The light was waning by this time but it was still a beautiful sight, don’t you think? Our evening ended, as I said, with an incredibly wonderful meal at The Dining Room and as we waddled out the door we reflected on how blessed we are, how nice it is to be back in North Carolina and how our amazing God allows us to live in His beautiful world. Savor each moment, my friends. 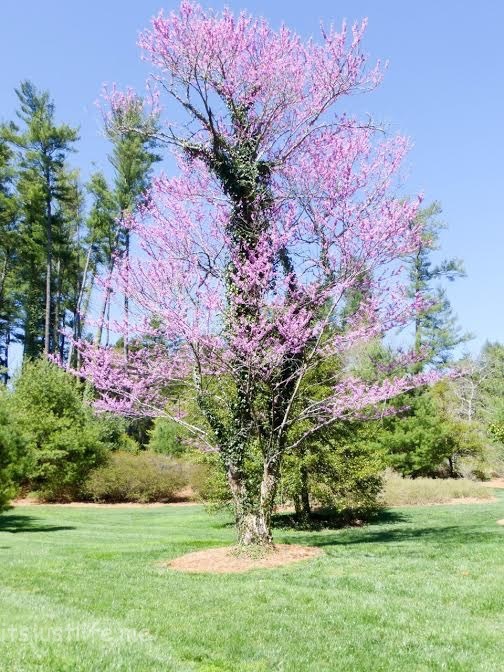 It doesn’t have to be a trip to The Biltmore –it can simply be taking in the beauty around you in your own backyard. It is there. Just look for it. Stop back tomorrow for more Biltmore love —another installment of Fashionable Romance. I totally agree with you! And it is amazing how quickly they popped out after my last visit there when there seemed to be nothing ready to bloom! Absolutely gorgeous! Thanks for an enticing taste of springtime,,, which we are sorely lacking in North Iowa right now. Thanks, Laura. It will come to Iowa. It always does! 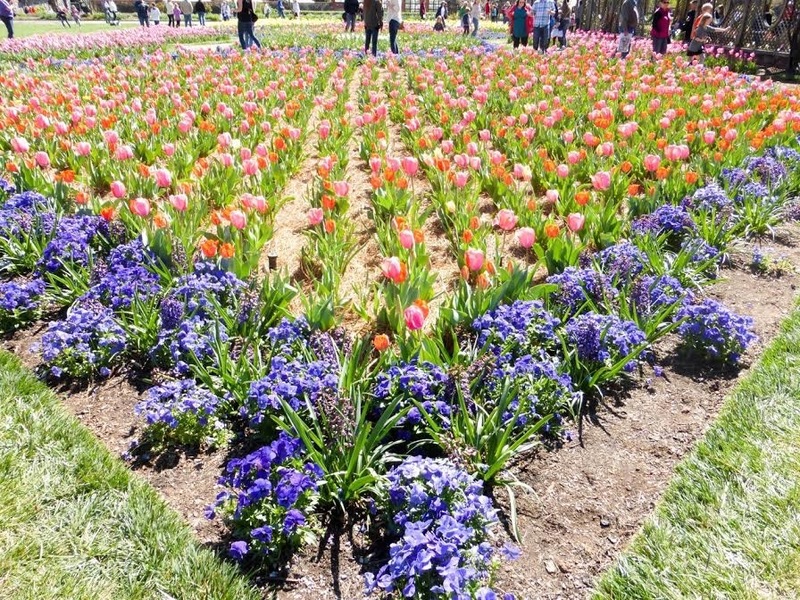 I’m loving all the spring flowers and cannot wait until that starts happening here in Iowa! What a lovely springy post! 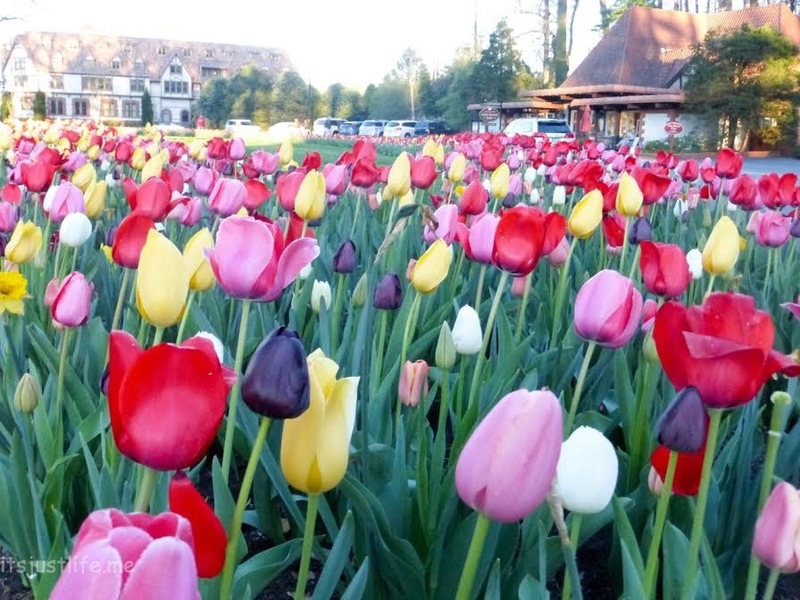 The tulips are wonderful, my feel good flower. I hope to see some in Holland at the end of this month. Oh that would be amazing to actually see them in Holland! After this post, I love the Biltmore even more. Thank you for taking me away from the Minnesota snow squalls of today into this slice of spring. Those flowers are stunning and I especially like your final photos taken during the golden hour. Lovely. You are welcome. Spring is coming to Minnesota soon.